There are very few things that I would not put Buffalo sauce on. I love the flavor and all the varieties of it. I have made all sorts of buffalo recipes, including one of my favorites the Buffalo Chicken Mac’N’Cheese Casserole. That recipe was some serious comfort food, but this recipe is a bit fancier and not so hard on your arteries. It is a good idea to grill the chicken for this recipe, but you can also bake it if you do not have access to a grill. I baked it when I originally cooked it. I got this recipe from Bobby Flay, from Food Network. 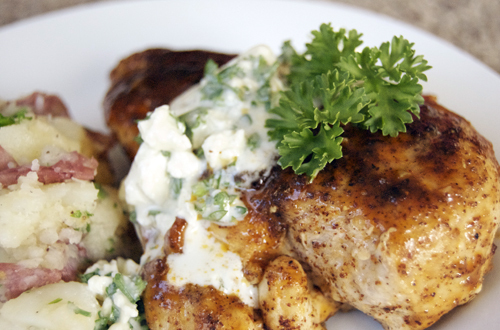 The buffalo glazed give the chicken a bit of spice and the bleu cheese dressing cooks it down. It is just like your favorite chicken wings, but made a little healthier and dressed up a bit. Preheat the grill to medium. Melt the butter over medium heat in a medium saucepan. Add the garlic and sautee for 1 minute, then whisk in 2 tbsp chile powder and stir for about 10 seconds. Stir in the honey and buffalo sauce, season to taste with salt and pepper, and set aside ¼ cup for garnishing. Sprinkle remaining chile powder, cumin, salt and pepper evenly over both sides of each breast. Drizzle each chicken breast with canola oil and grill over medium heat until charred, flip each and brush with the buffalo glaze. Cover and cook the chicken until cooked through, periodically brushing with the glaze (about 5 minutes). Meanwhile, whisk the heavy cream and creme fraiche in a bowl, stir in the parsley and cheese, and season to taste with salt and pepper. 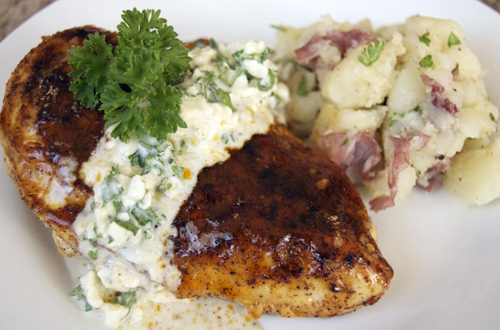 Place one chicken breast on each plate and brush with remaining glaze and cover with the blue cheese sauce before serving. Love this! Definitely a recipe that I will have to try out, sounds & looks amazing! I just bought Chicken leg quarters and was wondering how I would prepare them… of course I love buffalo sauce so I’m thinking that this is the way to go. Thanks for sharing – great picture too! That blue cheese sauce is out of control good! Well done 🙂 Buzzed! This chicken looks amazing! I love buffalo chicken, who doesn’t?! This look juicy and delicious! Yummy and it just looks so great. I’m always looking for new ways to cook chicken and this looks delicious! This looks sooooo delicious right up my alley. and I’m totally with you on loving me some buffalo sauce. Thanks for a lovely recipe!! Goodbye bland chicken — hello flavor! This looks so delicious! Wow…this dish looks great! My kids are big buffalo chicken fans…they’ll love this! what a wonderful and delicious dish! I love bleu cheese and love buffalo sauce….this is pure heaven! Congratulations on the top 9 today! Saw the title of this and the photo and buzzed immediately! I love anything that has been “buffaloed” and adding the requisite bleu cheese just made my day. Printing now! Wonderful recipe, and it looks phenomenal! I love your photos too! There’s some serious twang going on with this chicken. Yum!!! !Congrats on making Top 9.